. @LASchools board approved a teacher contract last month that will cost #LAUSD an extra $840M through 2021. Now what? The L.A. Unified school board has approved a contract with its teachers union that officials admit they can’t fully afford, calling the deal’s sustainability into question as the district receives repeated warnings from the county that it’s in severe financial straits. To shoulder about $840 million in added costs through 2021, district officials say they’re largely relying on more state funding and a 2020 California tax referendum — neither of which are guaranteed. District board members could also float a parcel tax, though it’s been unpopular in the past. Short-term fixes so far include cuts to the central office and the reassignment of some funds within the budget, a spokeswoman said via email. The contract compounds L.A. Unified’s financial woes, which include $15.2 billion in unfunded liabilities for post-employment benefits such as health care, about $500 million in annual deficit spending, and millions in funding losses due to declining student enrollment. The new deal, in fact, could drive up this year’s deficit by about $187 million, according to a recent district projection. The agreement tripled L.A. Unified’s previous offer — from $130 million to $403 million over three years — to lower class sizes and hire more support staff, such as nurses. While L.A. Unified ended last school year with nearly $2 billion in reserves, officials say most of it has already been earmarked for 6 percent raises, mandated programs, and filling budget shortfalls as the district continues to spend more than it takes in. And the clock is ticking for a solution. L.A. Unified has until March 18 to submit an updated fiscal stabilization plan to the county proving that it can keep its head above water through 2020-21 — even with the new contract deal. A team of four fiscal experts appointed by the county began “more regular face-to-face meetings with the district’s staff” last week after having extensively reviewed the district’s fiscal situation, team leader and former L.A. Unified chief operating officer Jim Morris told LA School Report. They are only serving in an advisory role. As of right now, L.A. Unified is projecting it won’t meet mandated reserve levels for 2020-21, which county superintendent Debra Duardo reminded the school board in late January is the recipe for the district losing control of its finances. “Should the [school board] fail to submit a [plan]” that fixes the financial picture, “I am prepared to take further actions,” she wrote in a letter to the board. District officials are banking on new funding at both the state and local levels to afford the contract. But the bulk of those funding ideas are either not yet guaranteed, far from fruition, or likely to face opposition. 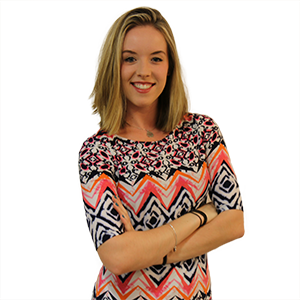 One of the most touted new funding streams is Gov. Gavin Newsom’s proposed 2019-20 budget. It includes a boost in K-12 and special education spending and a one-time $3 billion pot toward pension relief, generating an estimated $140 million in new revenues for the district, according to the state. About $44 million would be added to the district’s general fund annually starting in 2019-20, a district spokeswoman said in an email. The state Department of Finance did not respond by the time of publication explaining how the estimate was calculated. “The biggest issue is that [the contract] is based on two things: one, assumptions from the governor’s budget, and two, assumptions about future revenue,” said Alex Johnson, who sits on the county Board of Education. Those “are the two most critical things about this proposal that are concerning.” California watchers, including former governor Jerry Brown, are predicting a state recession after a period of soaring tax revenue growth. Charter schools have also become a political lightning rod in the search for funding. UTLA has repeatedly called for halting charter growth in L.A. Unified because the independently operated — and often non-unionized — schools siphon student funding away from traditional public schools. The L.A. Unified school board approved a resolution that helped end the strike asking the state for a moratorium on new charters in the district. And last week, Newsom announced that state Superintendent Tony Thurmond had been charged with establishing a panel of experts to explore how charter growth affects districts’ finances. State and local taxpayers are also being tapped as a new revenue source. Union and district officials are backing a Proposition 13 tax reform initiative on the 2020 ballot that, if approved by voters, would increase property taxes statewide on commercial and industrial properties and generate an estimated $1.4 billion for L.A. County schools. About 55 percent of California voters voiced “at least some support” for a change to this tax in a USC poll released last week. Some education observers note, though, that revenues from that tax reform would flow in too late, as the district is already expected to drain its reserves by 2021. A coalition of business groups has also denounced the measure and is pledging up to $100 million to defeat it. 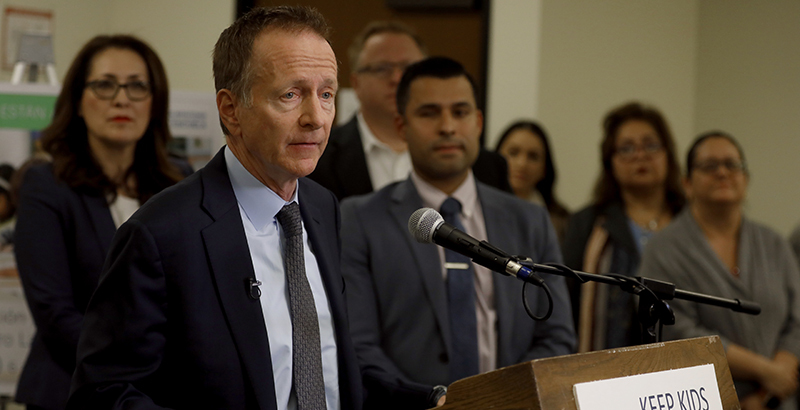 Locally, the school board has charged Superintendent Austin Beutner with crafting a three-year “enterprise plan” by March 18 to bring in more money to L.A. Unified. One possible option is adding a parcel tax — a property tax based on a property’s characteristics, such as its acreage or square footage, rather than its assessed value. A tax of about $600 per parcel could bring in about $500 million a year to L.A. Unified and essentially cover its deficit spending. Parcel taxes tend to take a greater percentage of income from lower-income taxpayers, however, and can therefore be unpopular. A call for a new parcel tax failed to pass a school board vote last year, and related measures in 2010 and 2012 were also unsuccessful. About 68 percent of local taxpayers last June said they supported a cheaper $330 parcel tax. A school board majority has to approve a parcel tax to place it on the ballot; at least two-thirds of district voters then have to vote for it. “We’re going to keep fighting on this taxation issue. There’ll be a big battle in 2020,” she said. Inouye did not respond to LA School Report’s request for comment or to discuss ideas the union might have on how the contract can be funded. The district is also scrutinizing its current spending obligations. L.A. Unified — which is locked into a separate health benefits contract for three years — proposed during the contract negotiations a two-year delay to when new teachers would start receiving the district’s generous lifetime health benefits. The district spends $1.1 billion a year — about 15 percent of its budget — on health and welfare benefits. These benefits, along with pensions, are expected to consume half of L.A. Unified’s budget by 2031-32. The union, however, rejected the proposal, citing in part the district’s reserves. Humphreville, a neighborhood council budget advocate and CityWatch contributor, said L.A. Unified can reduce spending by cutting administrators, too. The number of certified administrators in the district spiked 22 percent between 2011 and 2016, from 2,146 to 2,628, despite teacher and student enrollment declines. The district is losing at least 12,000 students a year, costing it about $130 million in lost state funding. L.A. Unified last year announced a 15 percent reduction of central office resources that will save $86 million over two years. Beutner last fall was also reportedly exploring a potential restructuring of the district into about 32 autonomous networks to further shrink the central office. That is an “ongoing” discussion and is not finalized, a district spokeswoman confirmed via email. The financial uncertainty has Sylvia Torres-Guillén, ACLU of California’s director of education equity, worried that the district will misallocate current funds — notably from the Local Control Funding Formula, the state’s funding mechanism that targets aid to low-income, foster, and English language learner students — in a scramble to pay for the contract. ACLU successfully sued the district in 2015 on the grounds that it misused about $450 million in local control state funding, she said. Whatever solutions the district comes up with, it will have to convince county overseers by mid-March that those steps will rightsize its reserve levels in order to stave off a takeover. If the county isn’t satisfied with updated financial projections, county superintendent Duardo can install a fiscal adviser with “stay and rescind power,” meaning he or she could rewrite budgets and overturn school board decisions. The district is on watch to begin with because its three-year reserve projections show a 0.96 percent cushion in 2020-21 — just under the mandated 1 percent minimum reserve school districts have to maintain. At least 1 percent of a district’s total expenditures has to be designated for “rainy day” emergencies. 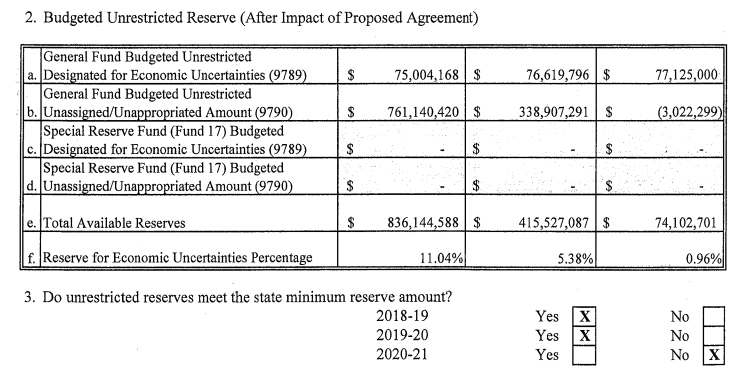 The latest budget document shows total available reserves plunging from about $836 million this year to about $74 million in 2020-21. She also again cautioned the district against relying “heavily on one-time funding sources and projected revenues,” such as Newsom’s proposed budget. While Duardo didn’t go so far as to recommend that board members reject the contract, Johnson, from the county board of education, noted that that’s not her job. UTLA has previously accused the county of working on the district’s side — an accusation district and county officials have stridently rejected. The union is skeptical of L.A. Unified’s financial projections. And there’s a reason for that: L.A. Unified ended last school year with a record nearly $2 billion in reserves, though district officials have stressed that most of that money was already earmarked. The district has also overstated its proverbial “fiscal cliff” in the past. It projected in 2016, for example, that it would be $400 million in the red by 2018-19. It isn’t. “There is a history of the district crying wolf over negative balances two years out that then never seem to arrive,” former Board District 5 member David Tokofsky in January told the union-funded website Capital & Main. Some education experts have noted, however, that the county’s recent involvement adds validity.